The blackout continues for ten more minutes while something inscrutable happens on stage. There’s the sound of water dripping and sloshing, maybe someone onstage is whistling. It’s actually Will Muñiz, the performer, wearing a black ghillie suit and mopping the floor. It’s still dark when he finishes his task, and it stays that way as he approaches a microphone, downstage center, and clears his throat. One audience member’s flashlight comes on, as if by magic. Whoever is holding it controls where it’s pointed—in some shows, the person points the light at Will. Other times they don’t. This is how the lighting for the whole production works: the audience isn’t in control of when their flashlight will turn on, or what color it will be, but they can light the stage however they want when they have the power. Kim Corbin and Chuck Squier performing. Photo by Siggi Ragnar. Except for a television onstage, the flashlights were the only lights in Basement Complex Suite 102, which I created with the company Jump-Start Performance Co., in San Antonio, Texas. My collaborators and I built them during the project’s development through a rigorous process of technical experimentation. In retrospect, designing and creating a wirelessly controlled lighting system that audience members hold was a ridiculous and risky thing to do, but I would do it again because we learned a ton, acquired a clutch of new skills, and the end result went beyond our expectations. It can be daunting to step outside the world of established, traditional theatrical technologies (and it is risky! ), but embracing the world of DIY enables new ways of making meaning on stage, and allows companies, even with tiny budgets, to create those new experiences for their audiences. We knew from the beginning that our show would take place in the dark. We wanted to explore the potential of performing on a barely visible stage, operating at the edges of visual intelligibility (and aural intelligibility, by a sort of thematic association). We also knew we wanted to devise the piece through rehearsals instead of working from a script. When we got into the room together, we started from nothing—but that’s always a kind of lie. We had a group of nine collaborators, a space to develop and perform in, and a vague set of concerns. We asked several questions to guide the piece’s creation, like the obvious: “What counts as darkness?” and “What happens in the dark?” Less obvious but more interesting to us was the question of how an audience would respond to a performance they couldn’t see very well. Would asking them to fill in perceptual blanks feel like a creative act on their part? We developed all aspects of the show simultaneously over the course of a year, consciously avoiding our tendency to privilege the text or performances. We brought potential technical elements into the room at the beginning of the process, which allowed the text and action to inform the technical elements (set, lighting, sound, costumes) but also for the technical elements to inform the text and action. This meant our team was creating on the fly, proposing and refining visual and sonic ideas throughout the process, and switching focus between acting and designing during rehearsals. Because of our “darkness” theme, we considered lighting strategies from day one. Jump-Start’s space has a small but efficient lighting system and an old-timey light board with faders but no memory or way to write cues. We wrestled with ways to modulate the show’s darkness using our theatrical lighting system. Ultimately, because we played with the lights in every rehearsal, we hit upon the idea of giving control to the audience and abandoning the theatrical lighting system entirely. A shot of Will Muñiz’s final monologue from the stage. Photo by Siggi Ragnar. 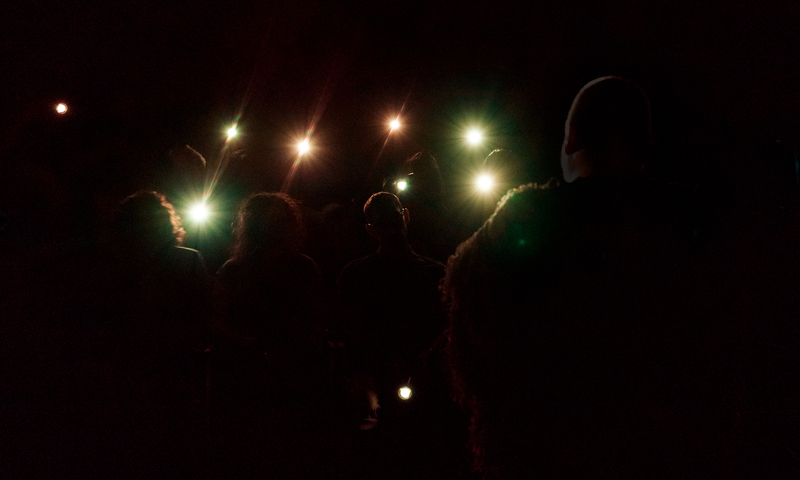 We incorporated store-bought flashlights into our rehearsals, but we quickly realized that handing the audience a bunch of flashlights from the dollar store wouldn’t work for us. We didn’t want the audience to be able to turn their flashlights on and off themselves; we wanted to decide when there would be total blackouts. We also wanted the color control that an LED-based theatrical lighting system would give us, in order to use color to affect the mood and meaning of each scene. Ultimately, we were putting control in the hands of our audience but wanted to carefully calibrate and refine its axes: the audience could choose where to point their flashlights, but not when they were on or off, their brightness, or their color. We wanted to create a spooky experience, and having a flashlight that operates independently is even spookier than having no light at all (because the lights are probably being operated by ghosts). I did some research to see if there was an existing product that would operate the way we needed it to. As much as I’m devoted to a DIY ethos, I also believe there’s no reason to re-invent the wheel if you don’t have to. The Gantom Torch, a small, color-changing flashlight designed to be used in haunted houses that could be operated wirelessly with an IR emitter, seemed promising. We ordered a couple to test them, but, when they arrived, we discovered their colors couldn’t be changed individually. While that was disappointing, finding a product that almost worked for us gave us the courage to pursue developing and building our own flashlights that would do exactly what we wanted. We had no idea what we were getting into. I’m a big believer in the power of internet forums; the ones focused on DIY tech and coding are full of people who are encouraging to beginners and excited about answering questions. So while we continued rehearsing and developing other aspects of the show, I spent time researching LEDs and how to control them. When I reached an impasse online, I got in touch with my professional lighting friends before diving back into the forums. 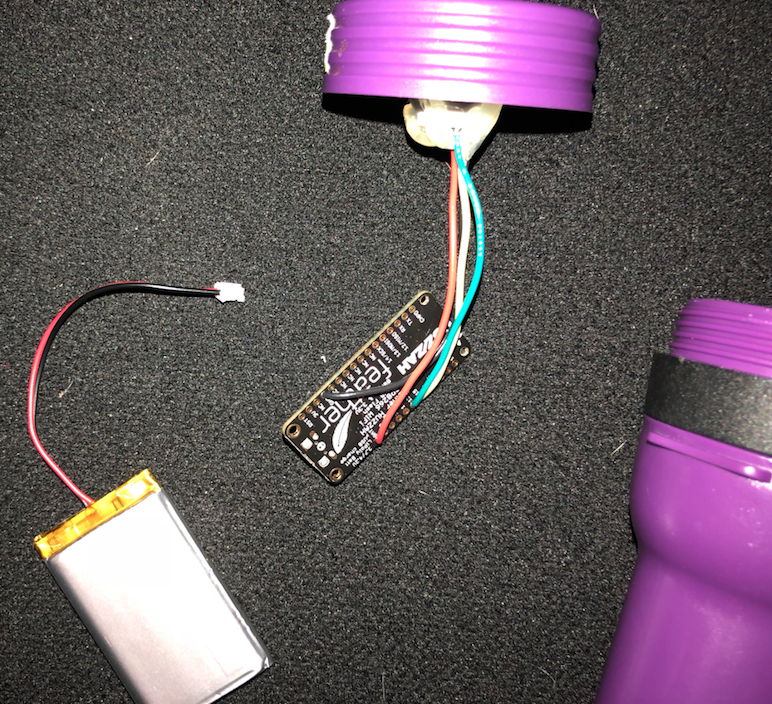 We ended up ordering the electronic components for the flashlights from Adafruit Industries, which creates and markets their supplies to beginners and hobbyists. 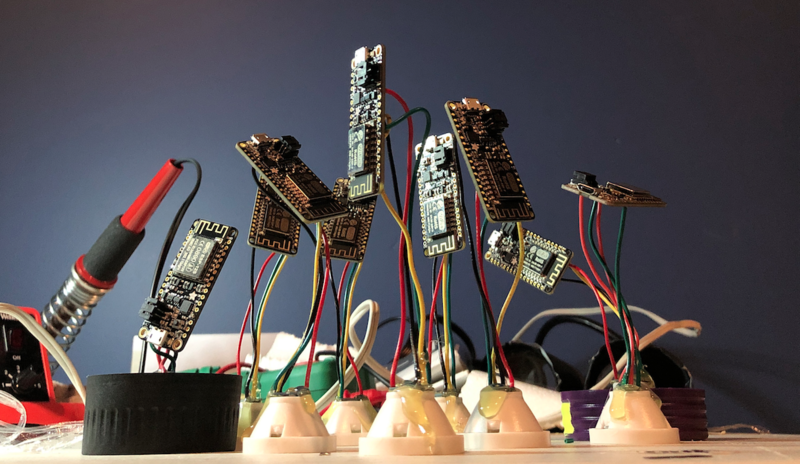 There’s a trade-off using hobbyist websites like Adafruit, because their products tend to be more expensive than at professional-focused ones like Mouser Electronics, but for us the tutorials and support provided was worth the extra expense. It also didn’t hurt that our audience size was only nineteen—if our goal had been to manufacture a hundred flashlights, we would have had to explore ways to keep the cost of components down. Ultimately, we were putting control in the hands of our audience but wanted to carefully calibrate and refine its axes: the audience could choose where to point their flashlights, but not when they were on or off, their brightness, or their color. Even with the user-friendliness of Adafruit’s site, the help of the internet, and a room full of fairly smart collaborators, we went down several blind alleys before we figured out which LEDs to use and how to control them, what wireless protocol was needed to communicate with the board that controlled each LED, and what software to use at the main computer to communicate with each flashlight. After purchasing flashlights from the dollar store down the street, we took them apart to use the housings. We settled on Adafruit’s Feather HUZZAH board as the “brain” of each flashlight, because it is Wi-Fi enabled and we could easily communicate with it from our main show computer. We used one of Adafruit’s DotStar Addressable 5050 RGB LEDs in each flashlight because they came with an integrated LED driver. A disassembled flashlight. Photo by Daniel Jackson. On the software/programming side, we had to learn to program the Feather HUZZAH board (it’s compatible with Arduino, which is a programming language for microcontrollers) to control the LEDs and respond to commands sent from the main show computer. On the main show computer, we chose to use a piece of software called Max to communicate with each flashlight, because it was fairly flexible and allowed us to create a spreadsheet of cues so our lighting operator could work in a paradigm she was familiar with (a “go” button to step through cues, essentially). We used a language/protocol called Open Sound Control as the bridge between the main computer and each flashlight so they could communicate with each other. When we finally completed the flashlights and their control system, we began to incorporate them into the show. It’s hard to rehearse a lighting system meant to be held by audience members without an audience. We managed to get two full houses to the theatre during our rehearsal process, though, to test it out. On other days, we made do by strategically setting the flashlights in the audience bank to approximate where they would be. By assigning specific flashlights to specific seats, we were able to choreograph certain effects. The lighting design for the final monologue is a good example. That scene begins with all flashlights lit but, gradually, starting at the edges of the audiences, one by one they blink out until only the center flashlight remains. We were worried about our lighting cues not working if an assigned flashlight wasn’t taken, but luckily that didn’t happen. Flashlight guts waiting to be assembled. Photo by Daniel Jackson. In performance, audiences responded beautifully to being put in control of the show’s lighting. We didn’t give them any instruction other than to tell them their flashlights would turn on and off during the show and that there were no other lights. Some audience members clearly felt a duty to illuminate what they thought they were supposed to. Others forgot they had flashlights and left them pointed at the floor or into their laps when they turned on. My favorite moments were when people waved their flashlights around like giddy children, clearly excited about their newfound power. Because the audience was different every night, the show was different every night, but each one was a success. Writing all of our process out, it sounds like a lot. And it was! But with perseverance and the willingness to learn new things (and ask for help) we were able to pull it off. Of course, we could have made the show with a traditional theatrical lighting system, but it wouldn’t have been the same show, and it wouldn’t have been as rich an experience for our audiences. By poking at the edges of what’s technically possible, even small companies like ours can open up new avenues of expression. And by making a commitment to incorporate the design and technical aspects of the show into the rehearsal and development process, and to take a risk and bring DIY technology into that process, we were able to create a truly unique experience. I really believe anyone can do the same.